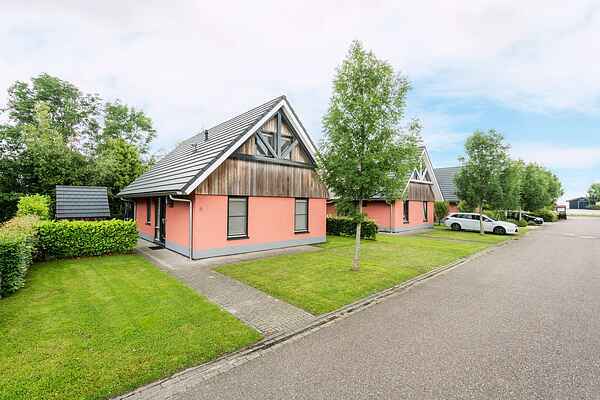 In the Frisian village of Balk you will find this modern and comfortably furnished holiday home. The apartment is located on a small park with a total of 18 houses. The homes lie directly on the Slotermeer, 50 metres walk from a sandy beach with sunbathing area and beach pavilion, where you can enjoy lunch or dinner. The yacht marina, playground and boat hire are only 100 metres away. Through the quiet character of the Slotermeer and the absence of commercial shipping, this location is particularly suitable for swimmers, surfers, water skiers and sailors. You can also reach other fantastic Frisian lakes from the Slotermeer, such as the Heegermeer and the Fluessen. There are moorings available for water sports enthusiasts who want to bring a sailboat or motorboat. The nostalgic centre of Balk, with many shops, restaurants and nightlife, is about 1 km away. Within cycling distance you will find the characteristic Frisian watersports locations of Sloten, Heeg, Woudsend, Stavoren and Lemmer. Golf courses and the forests of Gaasterland are 5 km away.